VOTE NOW for the $100 grand prize winner. Voting ends Saturday, March 17th. ...then VOTE by replying to this email with the number (1, 2, 3, 4, 5 or 6) that corresponds to your choice. 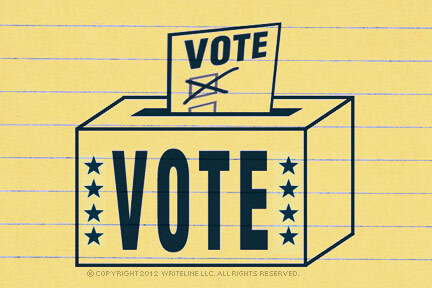 Voting ends on Saturday 3/17/2012. The winner, announced on March 20th (3/20/2012), will receive the Grand Prize of $100. All finalists receive an autographed copy of the Discover America Diaries. This email was sent to [EMAIL]. You are receiving this email because you subscribed to the "Discover America Through Postcards" weekly email. 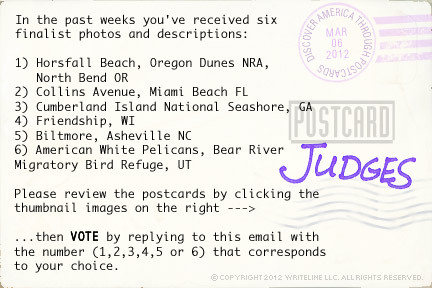 To ensure delivery straight to your Inbox, please add america postcardsfrom.com to your whitelist. Copyright © 2012 WriteLine LLC. All Rights Reserved.